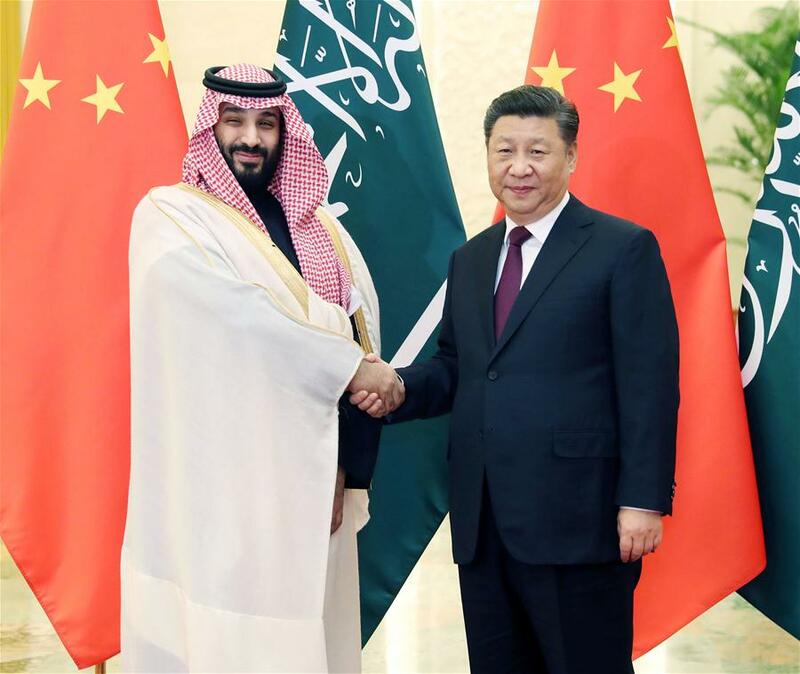 BEIJING, Feb. 22 (Xinhua) -- Chinese President Xi Jinping on Friday met with Mohammed bin Salman Al Saud, Saudi Arabia's crown prince, at the Great Hall of the People in Beijing. Xi asked Mohammed to convey his cordial greetings to Saudi King Salman bin Abdulaziz Al Saud. "China regards Saudi Arabia as a good friend and partner and is ready to work jointly with Saudi Arabia to build on past achievements to open up a new horizon for bilateral friendship and strategic relationship," said Xi, noting that with the guidance of high-level leaders at both sides, the comprehensive strategic partnership between the two countries have formed a new pattern in recent years, in which the relationship is being advanced in an all-around way, at multiple levels and in a wide variety of fields. China and Saudi Arabia should continue to extend mutual support on issues involving each other's core interests and major concerns and promote political mutual trust, he said. China firmly supports Saudi Arabia's efforts on promoting economic diversification and social reforms and safeguarding its national sovereignty, security and stability, stated Xi, saying that China opposes any moves to interfere in Saudi Arabia's internal affairs. The Chinese president called on the two sides to reinforce synergy of development strategies and cement the integration of each other's interests. "The two countries should speed up the signing of an implementation plan on connecting the Belt and Road Initiative with the Saudi Vision 2030," Xi said, also expecting further progress on pragmatic cooperation in areas such as energy, infrastructure, trade, investment and high value-added industries. The two countries should jointly press ahead with the construction of China-Gulf Cooperation Council (GCC) free trade zone. Xi said China supports peace appeals of the people in the Middle East, supports efforts of the countries in the region on reform and transformation and appreciates Saudi Arabia's active efforts to maintain regional peace, stability and development. China is ready to work with Saudi Arabia to jointly explore a governance path in the Middle East featuring the moves of "promoting peace through development" and to work toward a solid foundation for peace and stability in the region through jointly building the Belt and Road and strengthening regional development cooperation, said Xi. The two sides should jointly encourage and support all parties to resolve hot issues by political channels through dialogue and consultation, he said. "The two sides should promote counter-terrorism cooperation in the Middle East, strengthen international de-extremism cooperation and prevent the spread and infiltration of extremism," Xi said. Mohammed conveyed cordial greetings and best wishes for Xi from Saudi King Salman bin Abdulaziz Al Saud. Saudi Arabia and China have a long history of friendly exchanges, enjoy an amicable relationship and a rapid development in economic and trade cooperation at present and there is no divergence between the two sides, Mohammed said. "Saudi Arabia is full of confidence in the bright future of China's development under the leadership of President Xi," He said, "We see China as an important strategic partner and appreciate China's support for the domestic reforms and development of Saudi Arabia." Noting that the Arabian Peninsula is a part of the ancient Silk Road, Mohammed said Saudi Arabia supports the Belt and Road Initiative and hopes to align it with the Saudi Vision 2030 to deepen bilateral practical cooperation in various fields. "Saudi Arabia firmly adheres to the one-China policy. We respect and support China's rights to take counter-terrorism and de-extremism measures to safeguard national security. We stand ready to strengthen cooperation with China," he said. Saudi Arabia attaches great importance to China's positive role in global and regional affairs and wishes to further strengthen communication and coordination with China, Mohammed added.